Spice up your back yard garden area with Lewisia Solar Water Fountain. Start hearing the calming sound of running water in just minutes, create your very own tranquil paradise. Great for pool, pond, big bird bath, fish tank, garden decoration, water circulation for oxygen, etc. Solar Panel Size: 13.4" x 10.2" x 7.1"
1. It's better to peel off the plastic film protector on the solar panle. 2. 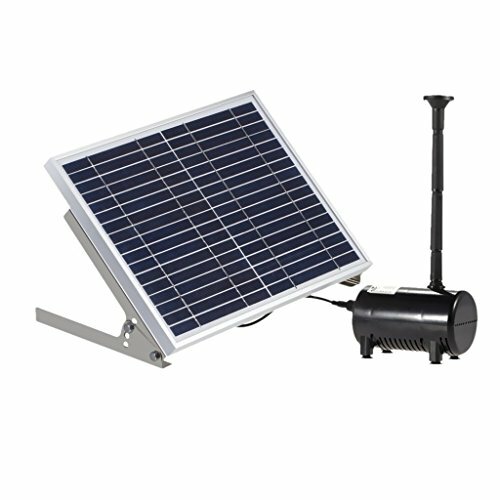 Make sure that you submerge the solar pump in water before you expose it to sunlight because it turns on IMMEDIATELY with CONSTANT, DIRECT sunlight. 3. Sensitive to light, shadows, clouds. The more sunshine the more power it gives off. On a very cloudy day, there may be little to no water coming out, because this has no battery or form of external power. 4. Clean the pump regularly. If it's clogged, it will stop working. 5. The pump itself is not adjustable but with the attachments you can adjust the spout height and shape. Longer Cable Length --- 16.4 feet (5m) cord from the pump to the solar panel so it would get sun most of the day. You can have the fountain in the shade but the panel in the sun. If you have any questions about this product by Lewisia, contact us by completing and submitting the form below. If you are looking for a specif part number, please include it with your message.